Waiting your turn is part of the course. 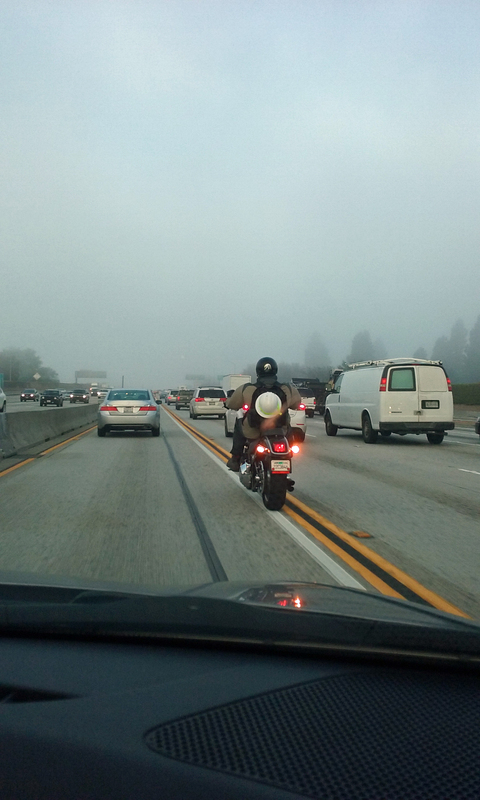 I had one of the most exciting motorcyle rides of my life this past weekend — in a parking lot. My husband had signed up for the Advanced Rider course with the Motorcycle Safety Foundation (MSF). 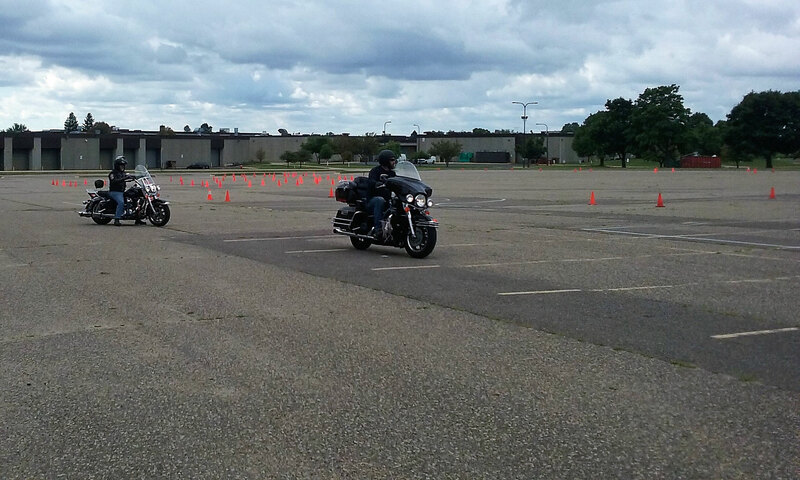 Six of us gathered in the parking lot at North Hennepin Technical College on Sunday morning for an eight-hour course on the finer points of riding a bike. The weather had cooled off and a nice breeze blew over the parking lot, which was dotted with orange traffic cones laid out in various formations. I tagged along so Ralph could practice the maneuvers on his own and with a passenger on the back. It was a blast! cycle cop who has the bearing and voice of a Marine drill instructor combined with effervescent enthusiasm and encouragement. He was assisted by Suzanne Greer, whose poise and posture on a bike is incredible. She, too, is a very encouraging individual. Slow and 30 mph offset weaves. Tight and locked turns in confined spaces. 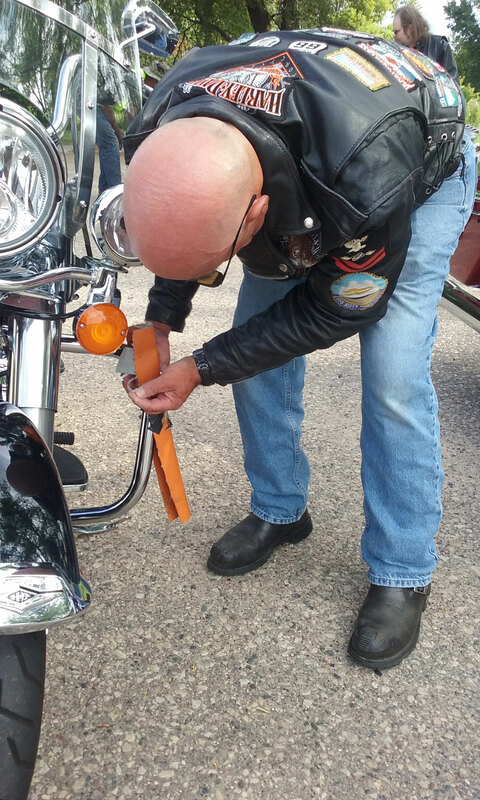 Prepping the bike for the Advanced Rider course means removing the saddlebags and covering anything that might get scratched or dinged! After doing a few slow exercises, the motorcylce engines were hot. That’s when Suzanne took us on a wild ride throughout the technical college campus to “breeze out” the bikes. We rode up wheelchair ramps and across sidewalks, made U-turns in tight spaces and, essentially, performed all the skills we’d just learned. We circled around and rode figure 8s in front of the Basic Rider class, who stopped to see what we were doing. The kicker was the final turn. (Suzanne said afterward, “I was thinking, should I go for it? Yeah, why not!”) Suzanne made a 90-degree turn onto a sidewalk right next to a parked, bright-yellow Camaro and a black Lamborghini, and proceeded to drive down the walk. Only one rider put a foot down, and no one missed the turn or hit the cars. I think my eyes were the size of dinner plates. After lunch we worked on 30-mph offset weaves and emergency stops. After all the low-speed work, 30 felt like 60. Fun! Riding a motorcycle is about more than going fast. There are a lot of little things that can make a big difference in your driving. As a passenger, I learned how I can help the driver. A good thing to know as we prepare for our summer vacation. This pullout on Hwy. 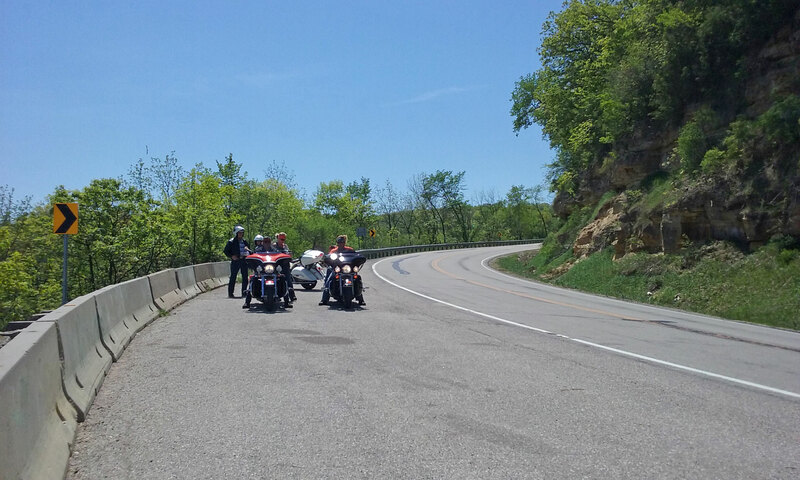 60 above Wabasha is a popular stop for bikers. We haven’t decided where or when our next vacation will take place, but this past weekend was a fantastic chance to get our long-distance riding muscles in shape. With temps in the low 80s and clear blue skies, there was no reason to stay at home! We rode MN 3 down to Faribault, one of the oldest cities in Minnesota. We latched onto the highway in Inver Grove Heights and had a ball riding the curves around little lakes and not-so-little houses. Farmers were out plowing their fields or moving equipment from one field to another. The air was filled with the fresh scents of newly-turned earth, apple blossoms and lilacs. Magnificent! After passing through Northfield, we stopped for lunch at Bernie’s in downtown Faribault. I would have liked to have stayed longer and poked my nose into the antique shops, but the day was about the ride. 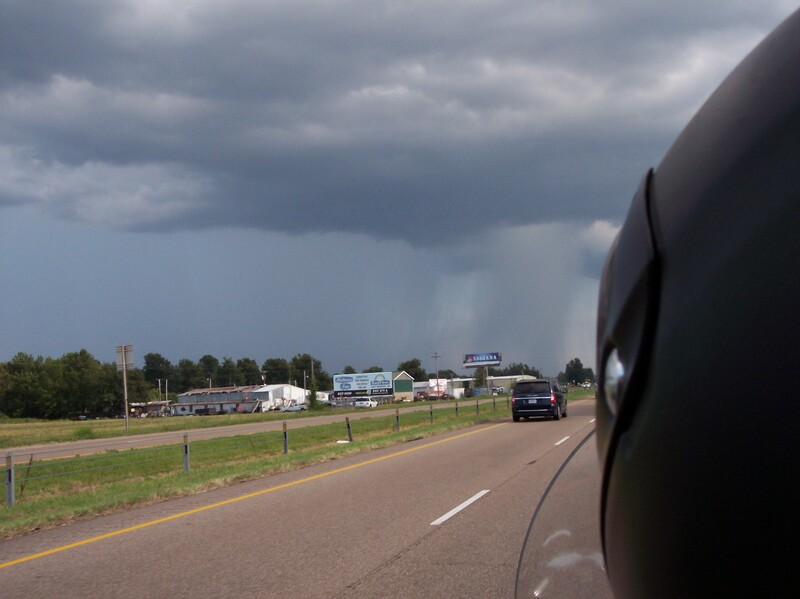 After paying our bill, we saddled up again and headed east out of town on Hwy. 60. As you leave Faribault, you also leave the flat prairie behind. The countryside begins to roll more, and the road becomes curvier as you approach the Mississippi River and bluff country. Limestone outcroppings pop up here and there as you pass through Zumbrota, Mazeppa, and Zumbro Falls. 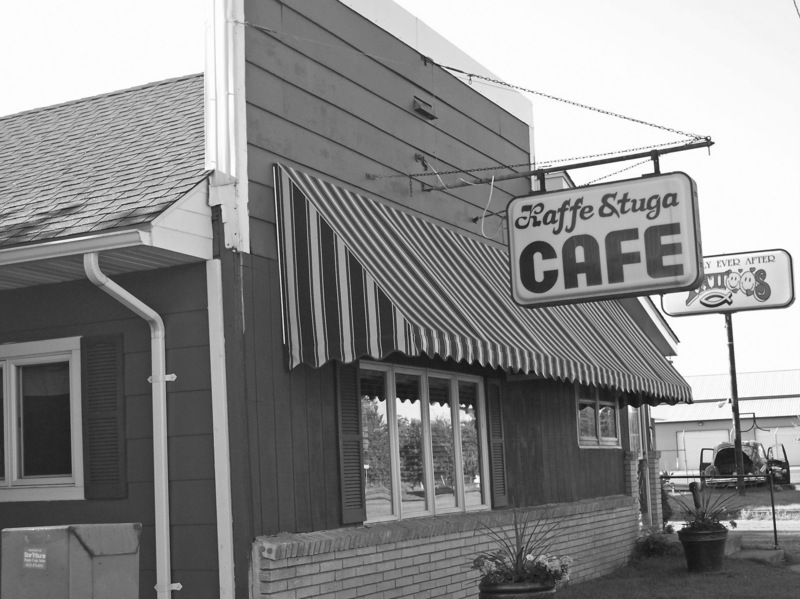 As you approach Wabasha, the road climbs upward past the Coffee Mill Golf Course. Suddenly, you look out over the broad river valley below. After a brief stop at the pullout to take a better look, you get back on your bike and swoop into Wabasha. We spent a good hour at the National Eagle Center learning about eagles and just enjoying the view of the Mississippi from the deck. 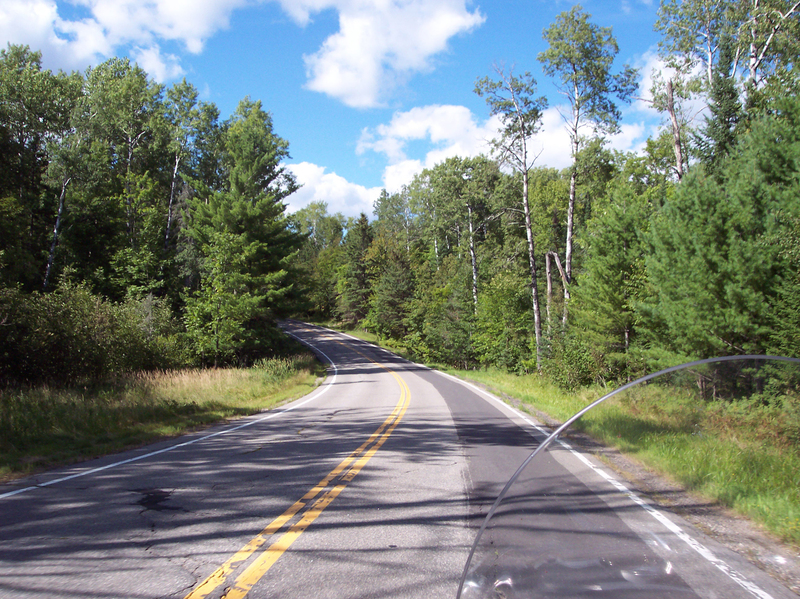 Then we climbed aboard our Road King again and crossed the bridge into Wisconsin, where we turned up WI 35 toward home. It was an absolutely perfect day. The only thing that would have made it better was if I’d put an SD chip in my GoPro camera. It would be so fun show those curves on this page! So long, Victory! It’s been good to know you. News that Polaris Industries is shutting down the manufacture of its Victory motorcycles is roiling the small but loyal group of Victory owners across the U.S. Yet, in a way, it comes as no surprise. It’s hard to find a Victory dealer when you’re out on the road. Polaris never really made owning a Victory a cult thing. I have spent many hours in motorcycle dealerships, selling and signing my books. What impressed me most was the way Harley-Davidson not only enforces its brand, but encourages it. Walk into a Victory dealer, and you may encounter a jacket or two, some motor oil and some T-shirts. 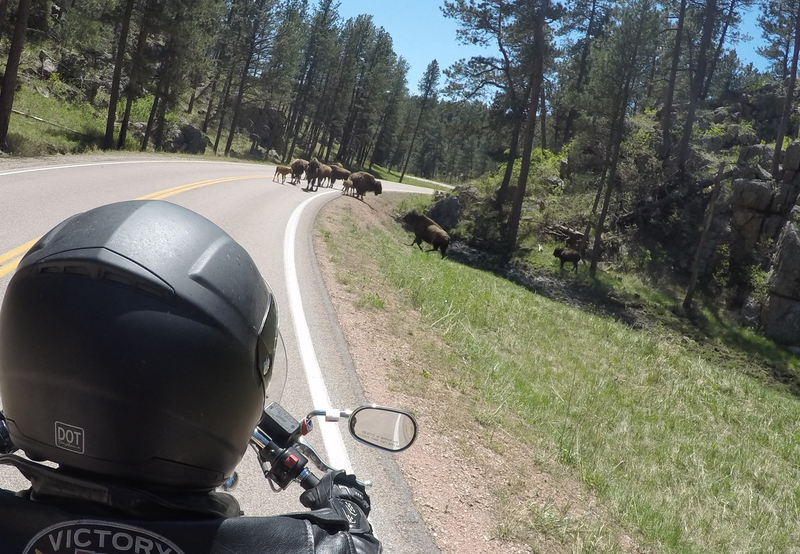 The motorcycles may share space with ATVs, snowmobiles or other motorcycle brands. Walk into a Harley dealer, and it’s all Harley. H-D clothing, motor oil, bar stools, drinkware — that Harley-Davidson shield is on everything! If there is a competing bike brand on the showroom floor, it’s probably been traded in for a Harley. Two summers ago, we attended the national rally of the Victory Motorcycle Club in Murfreesboro, Tennessee. Our Victory, a 2002 Deluxe Touring Cruiser, was easily the oldest of the thousands of bikes parked at the hotel. There was a distinct “underdog” camaraderie among the riders. We all knew Victory motorcycles were good. But, like car-rental firm Avis used to say in its advertising, there was also a feeling of “We Try Harder.” We all wondered what Polaris’ acquisition of the Indian brand would mean. And now we know. Indian will once again go head-to-head with Polaris, and Victory will be no more. Indian will still have long way to go to take market share from H-D. Even if the Victory dealerships are replaced with Indian dealerships, they will still be too few and far between. Which is why we traded our Victory last summer for a Harley Road King. Harley dealers are much easier to find when you’re a long way from home.